For anyone doing portrait work, the term “beauty dish” is bound to crop up sometime or another, whether it's reading Strobist, looking at the technical notes from shoots, or simply surfing for more gear you don't need. Over the last year, there's been a lot of interest in DIY (do it yourself) beauty dishes, made of everything from plastic salad bowls to aluminum turkey roasting pans. With the annual slowdown of concert season this winter, I decided to undertake my own DIY project and set out to see what this beauty dish business was all about. If you don't want to build your own beauty dish, there are lots of options available for photographers using speedlights all the way up to studio strobes. is also available for a cheap $48. These are the cheapest beauty dishes available, come ready to mount a speedlight flash, and they're still much less expensive than the top of the line Mola beauty dishes that we all really want. If you're looking for a beauty dish for your small flash and don't have the power tools to make my design, I recommend these choices. For everyone else shooting studio strobes, you can see a huge variety of beauty dishes from B&H Photo Video here. , all of which seemed pretty weak, I set out to make my own design. 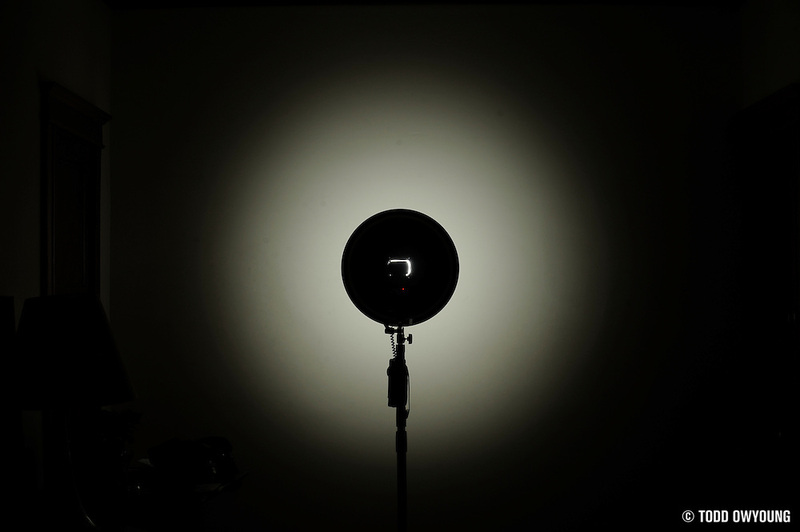 I made my first DIY beauty dish mid-December 2009 – the Mark I. While together with my brother Chris for the holidays, we decided to undertake construction of the Mark II design. 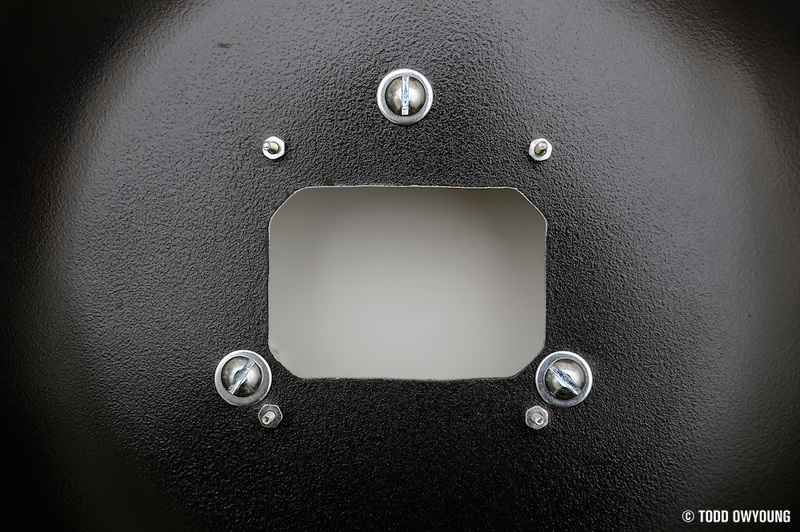 The main differences between the first and second designs center around tweaks to the beauty dish's internal reflector. After scouring Google, Flickr, and various photography websites, I had a good idea of how I wanted to approach my DIY beauty dish. While a lot of the existing designs feature plastic elements, I figured that I'd go for all-metal construction for my dish. And, what better resource to use for materials than a place that is no stranger to use and abuse: the kitchen. was perfect. The source for these items? A Chinese restaurant supply warehouse. Obviously this part isn't free. I have the 15″ Lastolite EZYBox Softbox, and while I considered going with a 100% DIY solution with a 5″ L-bracket from Home Depot, I figured that the pre-fab bracket would make this project all that much easier while providing a more reliable and adjustable bracket for mounting different kinds of speedlights. , which features the same bracket and has the bonus of giving you a 16-inch collapsible softbox for just $0.51 more. It's worth nothing that the newer Mark II bracket from Lastolite does not feature the same pre-drilled holes as the Mark I design. Detail shots of making the dish are at the end of this article. Be sure to check out the walk-through video of this design's construction, too. Using the stencil for the flash opening, mark out on the dish where you'll need to cut. Also, determine where you'll need to drill for the mounting bracket and for the hardware that will secure the internal reflector.
. You'll probably want a pair of earplugs while you're cutting the metal. Now you're ready to paint the interior of the mixing bowl, but before you do, tape up the flash opening and the drilled holes on the back of the bowl with masking tape. I recommend three coats, with 20-30 minutes minutes drying time in between coats. Save some spray paint if you're “detail oriented” like me and want to perform touch ups after the black paint. After painting the interior of the bowl, paint back of the dish with flat black. Again, you'll want to tape up the flash opening and mounting holes, this time on the interior of the dish, with masking tape. If you're looking to save money, you can skip painting the back of the dish – your DIY dish will just look a lot more do-it-yourself. Painting the exterior last means that you'll have a nice clean edge black-white around the rim of the bowl. After the paint and polycrylic coating are dry, it's time to assemble the return on the interior of the dish. Due to the way the mounting bracket overlaps the dish, it's necessary to first screw on the hardware for mounting the internal reflector. This is where the 1/4″-20 3″ machine screws and the appropriate fasteners come in. Once you've installed the internal reflector, attach the flash bracket to the dish with the #4 machine screws and fasteners. At this point, things should be looking pretty good, but you're not finished yet. Remember the adjustable return? The last step is to fine tune this internal reflector to provide the most even and efficient diffusion of light possible. Since the internal reflector is held in place by the jam nuts on internal reflector, just screw on the jam nuts closer or farther away from the flash to adjust. Every combination of bowl and return will be different, so you'll have to tweak your design. Now, photographing a wall is all well and good – but how does the beauty dish do on real live humans? You can see more samples of the Chinatown Special Mark II in my band portraits, where I use this modifier extensively. A lot of the DIY designs I saw on different blogs featured a 3″ convex mirror in the internal reflector (most famously David Tejada's Home Depot-sourced dish). For efficiency, this sounds great, but when I looked at most commercial beauty dishes, they all featured white returns and no specular reflection. I had to investigate. 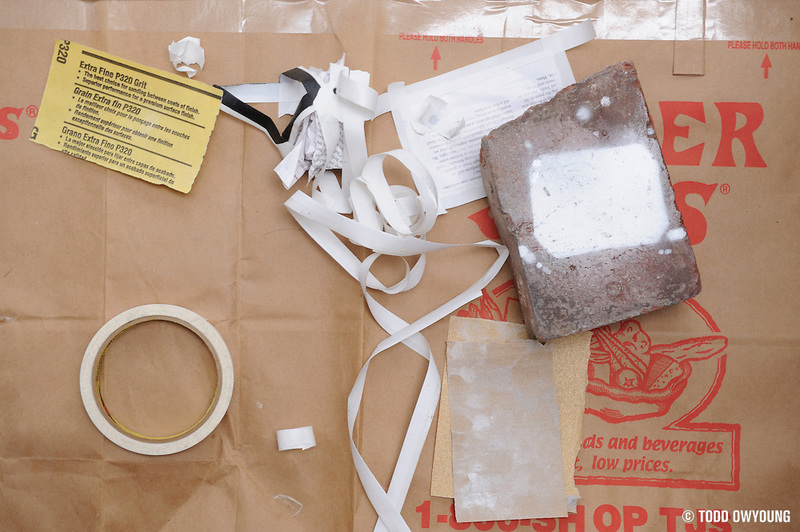 There you have it – one music photographer's DIY beauty dish, AKA the Chinatown Special. Be sure to check out the samples I posted earlier for an idea of this beauty dish's output. My brother Chris and I had a blast making this little homebrew project and I'm excited to put this light modifier to the test for future shoots. Due to the relatively small size, I think this beauty dish will work out great for band portraits and promos, either on a boom or simply on a light stand. If you end up making a beauty dish with this design as a reference, no matter how small, I'd love to hear from you and your experiences. Feel free to ask questions as well if there's anything I've left out that you want to know. Thanks for reading. The above image was shot with a Nikon SB-900 fired into the “Chinatown Special” DIY beauty dish camera right. Two Nikon SB-600s at 45º fired from behind. One SB-900 with a snoot fired behind at the wall. Great build/tutorial in Spanish using this design. Gregory Tran's version of this design, using an L-plate instead of the Lastolate bracket. Wes Taylor's version of the Chinatown Special, also using an L-plate. Another Chinatown Special with a custom bracket/plate that also holds the flash perpendicularly. An example of the Chinatown Special DIY beauty dish made for two flashes. A fantastically detailed tutorial for this DIY beauty dish build in Spanish. 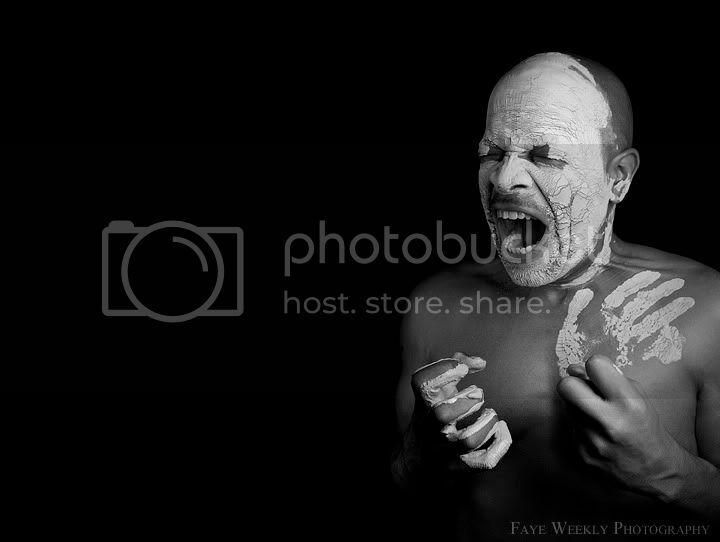 In addition, the Strobist Flickr Group was a great resource for this topic, with plenty of discussions on making your own beauty dish.
. A smaller 16″ Beauty Dish from Cowboystudio is also available for a cheap $48. These are the cheapest beauty dishes available, come ready to mount a speedlight flash, and they're still much less expensive than the top of the line Mola beauty dishes that we all really want. Finally, I've received a lot of comments and emails about a sock for this dish. 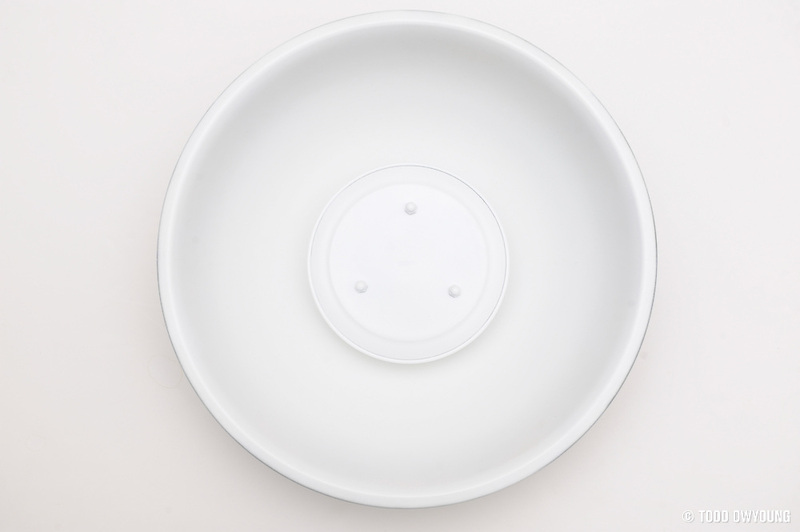 I'd recommend this ready-made Beauty Dish Diffuser for 19-22″ diameter dishes— it's a 2-pack and the price is right. There's also a model for 12-16″ diameter beauty dishes. If these instructions have been helpful to you, please drop me a comment, share this link, and go make a DIY beauty dish. Or, if you're so inclined, buy yourself something nice through my affiliate links through B&H Photo in New York. Thanks for reading. 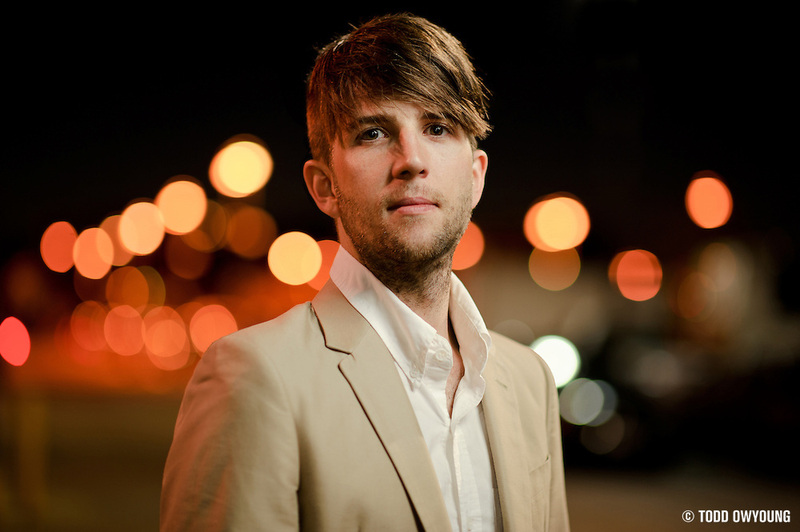 You can see more examples of the Chinatown Special in my band promos and portraits. For the video walk-through, check out this four-minute tutorial. As always with you – I really have one short comment – this is AWESOME. The result looks professional, flexible, with repeatable results for any speedlight shooter. Thanks for the comment, I appreciate it. This beauty dish was fun to design and I hope it proves useful for strobist shooters everywhere. Cheers. yes, yes, yes! i love it. if i had only seen this before i purchased mine… i may still try to construct it because hey, you can never have too much gear available to you, right? thanks for the amazing and thorough post. No, one can never have too much photo gear, especially of the DIY variety. Please let me know how this design works out for you if you build it. Thanks for the comment, Melissa. I figure making DIY photo gear is like cooking instead of eating out. It’s usually cheaper, messier, and often more fun. What a fantastic post! Considering I live a few blocks over from Chinatown in NYC, I’m chomping at the bit to make my Chinatown Special Beauty Dish this weekend! Many thanks for the detailed and informative post! You rock! Thanks for the comment. If you do make a DIY beauty dish from this design, I’d love to hear how it goes. Hopefully you can find everything you need between Chinatown and a hardware store. This looks awesome. Thanks so much for the detailed, easy to understand instructions. They’re much appreciated! Can’t wait to try and make one. Thanks for the kind words, glad to share this design. Please let me know if you do end up making one, I’d love to hear how it goes. Looks fantastic. Just might have to DIY one up this weekend. How hard was it to cut through the bowl? Thanks for the comment. The bowl used here is stainless steel, which is much harder than normal steel. With the reinforced fiber cutting wheels for the Dremel, it cuts pretty easily – you just need a steady hand. You can also use the stock cutting wheels that come with the Dremel, but they will get worn down very quickly. I just don’t want anyone being afraid of grabbing stainless steel because they’re convinced it’ll be harder to cut. Super! It looks really great. And thanks for all those explanations, they will be really useful when I try to make mine. Hope the instructions and design go well for you, let me know how it works out. Cheers. The Lastolite bracket really sets your design head and shoulders above what I’ve seen before. The dish looks beautiful. Thanks for giving good examples of optimizing the light, that helps a lot. A few questions, what kind of paint did you use? How did you prepare the surface? and do you anticipate the paint chipping easily from the stainless steel? Thanks for the kind words. I used Rust-oleum “Painter’s Touch” flat white and flat black paint. Flat white will help produce the smoothest output without hot spots. For the back of the dish, you can use whatever kind of paint you want, as it doesn’t have any effect on output – I just chose black. As noted in Step 4, I sanded the components – no primer. With a hard impact, the paint can chip off, but the polycrylic coating does a lot to minimize this. But with normal use, the paint is on there for good if you prep the surface correctly. Thanks Todd, I’m making one! 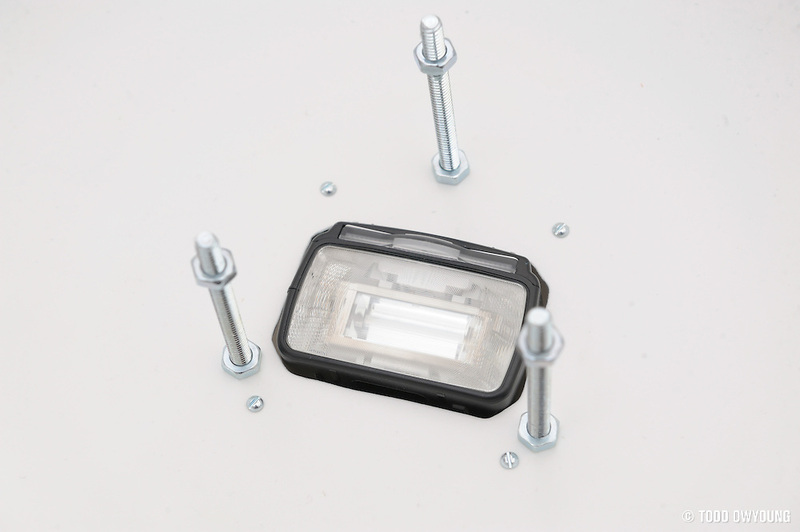 You might be able to buy the Lastolite bracket separately, but I would recommend going another route, as the bracket itself is rather expensive. There are knock-off brackets that can be had for about $30-$35 shipped on eBay. Regarding the bowl, the diameter of the bowl is 18 inches, or about 45cm. The 16-quart bowl I’m using was the best balance of weight and cost by my estimation. Buying a larger 18 or 20-quart bowl had a marginal increase in diameter, but those bowls were also heavier and cost 2x. Any kitchen supply store will be able to sort you out, I think, and should have something that’s usable for the internal reflector, too. Great work, as usual, Todd. The details about finishing and tuning the reflector make this even better, since that part is more important than the construction. I have to say that I’m always impressed by your writing. A lot of photographers can make great photos, but few have your knack for describing and detailing their work. It makes your site infinitely more interesting. Thanks for the kind words, I really appreciate your support. After tweaking the design of this reflector, I’m actually surprised that very few DIY designs mention adjusting the dish for the best output. One of the most fun parts about this project, aside from building four of these bad boys with my brother, was really fine tuning the output and trying different internal reflectors. Between the Mark I and Mark II designs, I tried about four internal reflectors and different configurations before settling on the final design. Ah the long awaited Chinatown Special MK II!! This is by far the most sophisticated and well-explained DIY beauty dish tutorial I’ve come across. Can’t wait to try it out myself. Thanks for sharin the wealth Todd! Thanks very much, very glad to hear that this beauty dish tutorial is easy to follow. I think of the Chinatown Special as just one in a long lineage of DIY beauty dishes, so I can only hope that this design is of interest to people. Please let me know how it goes for you when you make a dish of your own. I’ve been waiting with baited breath for this one, and damn if it doesn’t deliver. I’ll be building this today for sure. In fact I might make two, one with silver inside, for added contrast when needed. I’ll let you know how that turns out. Glad to hear this DIY beauty dish tutorial delivers. Phew! If you make a silver BD, I think a silver spray paint would work well. Even sanded, the stainless steel is going to be a bit too uneven, I think. I’ve been thinking the same thing, though my reason would be for more power (efficiency) in the modifier. Oh, one question. Any plans to make a grid or sock for this one? No plans to make a grid, but I may make a sock for it. You’re welcome! Let me know how it works out for you, good luck. This is by far, the best DIY beauty dish for a speedlight that I’ve seen, both in light quality and construction. 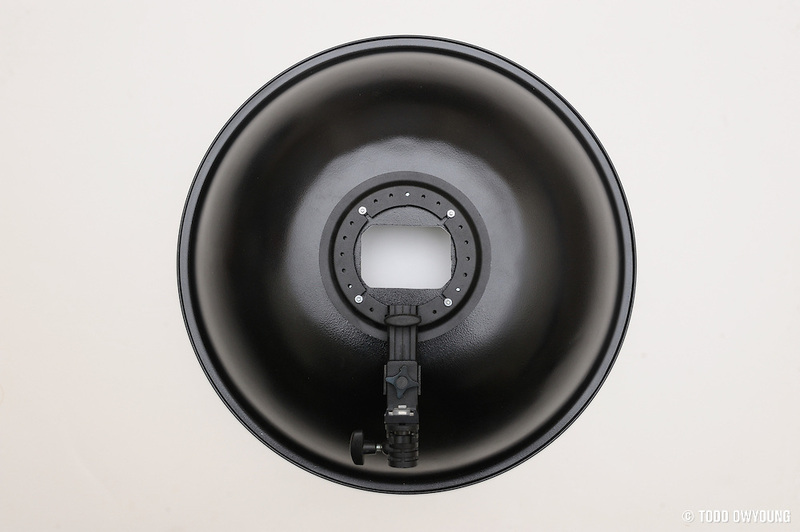 If you were to cut the hole for the strobe big enough to accommodate other strobes, I would suggest adding a piece of black craft foam over the strobe opening. With a couple of slits cut into the foam, you could put any strobe into the dish, and the foam would cover any excess space – preventing light spill. This way, you could use any battery operated flash or speedlight. Thanks for the kind work. Checked out your portfolio – good stuff. I’ve seen some other designs that feature the black foam – I think you’re right, that would be a nice addition to make the design universal. Cheers. another bracket option.. If someone posted already please forgive! Project Chinatown Special due to commence soon for my SB600. Thanks for the kind words – glad to hear people dig the design. We had a lot of fun making it. Let me know how the Chinatown Special works out for your SB-600! Will do! Hey would you mind giving me a quick critique on my band shots on my Flikr page? I have a bunch more but haven’t gotten around to uploading them yet. I think you’re doing pretty well considering the lighting and using a fixed lens. I think the images capture well the light and mood. For me, the trick to using a fixed lens like the 50mm is to make the lens invisible; the limitations of composition imposed by the single focal length are a challenge to the photographer, not an experience for the viewer. Why is this called a “Chinatown” Special ? Racial, Politcal, or because the wifey will not recognize it. Did you read this article and the design rationale? The dish nicknamed the “Chinatown Special” because the parts were sourced at a Chinese restaurant supply store, on the cheap. The latter part of the name also references how my brother and I feel about the performance of this design. I was so geared up to make one of these tonight but then I saw that the bracket is $80! Are there any less expensive alternatives? Great question. I would check out eBay – search for “speedlight bracket” and you should come back with some options. There are some produced by the company “ishoot” (no relation) that seem to ship direct from China for about $30-35. So, you should be able to build the beauty dish for roughly $20 in hardware and kitchen supplies and $35 for the bracket. If you go with the polycrylic, tack on another $10, for a total of around $65. AWESOME! I seriously got to try this eventually, need to learn other Nikon CLS things first though. Thanks for the comment, good luck with the dish. Nikon’s “creative lighting system” is great – not always ideal for all circumstances, but one would be surprised what’s possible without radio triggers, and the TTL control is fantastic for changing manual settings on the fly. Anyway, this is by far the best write up for a DYI beauty dish. I can’t wait to dive into it. Accomodating multiple flash heads is no problem. Just cut the flash opening for the lowest common denominator – in this case, the biggest flash head. The opening my brother and I cut for the Nikon SB-900 for this design is ~7.7cm x 5.3cm. The cost of this flexibility is that you’ll have some spill out the back when using smaller flashes. Thanks for the kind words, please let me know how building this design goes for you. First off, congratulations on the best BD DIY tutorial I’ve seen on the web so far! The details are perfect and I can’t wait to get on with the build. Unfortunately, living in the UK it has proved somewhat more tricky to get hold of similar bowls etc- I spent most of yesterday hunting catering suppliers and even went around the London Chinatown in the hope that I could replicate a UK Chinatown model! In the end, ebay to the rescue- now I just have to curb my impatience whilst I wait for the Chinese New Year celebrations to finish and take delivery of the essential elements for the project! 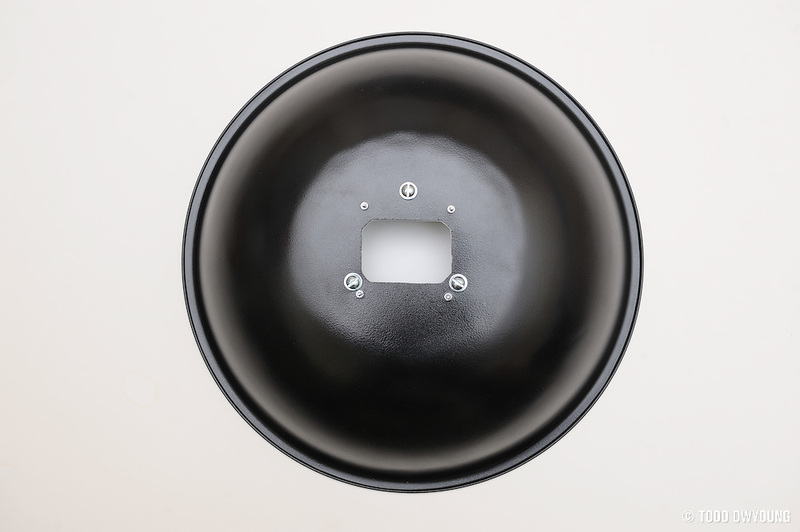 One question for you though if you don’t mind…..
I’m interested in the design of the internal reflector- I initially sourced an 8″ circular alu disk but it has no lip to it (unlike your pizza pan). I will try to get hold of an identical pizza pan but wondered if you had any thoughts on the importance of the concave shape in this part. Do you envisage a loss of reflected light around the bowl if I was to use a flat disk? I may well experiment with both but would value your thoughts before I start. Thanks for the comment, I appreciate it. Hope you found suitable dish/bowl for the project without paying too much. Regarding the internal reflector, I don’t think that a lack of a lip or sloping edge will matter too much. As I mentioned in the post, I tried a variety of different kinds of reflectors. Ultimately, each reflector is a little different, so you’ll have to tweak the design and adjust the distance at which the dish is smoothest and/or most efficient – and more likely, a balance of the two. In addition to the 8″ pizza pan, one reflector that I tried and which worked well was a 6″ (15cm) aluminum plate. With all the reflectors I tried, I tried them in both convex and concave positions relative to the flash. While I originally thought that a convex relation would be best and help push light into the sides of the dish, I found that the concave setup actually worked best for the smoothest light with no real change in the efficiency. Anyway, something to consider. I thin you should be fine with a flat disk for the reflector, anyway – most commercial beauty dishes have a flat return, for what it’s worth. Good luck, please drop me a note when you get a chance to assemble and try out the dish! I suppose putting small rubber feet on the front rim of the bowl might be a good idea if you’re worried about dinging up the paint. Great point. Some little rubber dots would be perfect for keeping pressure off the painted rim, and cheaper than the polycrylic. I have a BD for my Alien Bees that I love love love, but needless to say it’s rather unwieldy and not-so-location-shoot-ready. Something that can stick on a lightstand for my Speedlights would be really cool. Since my studio is blocks away from Chicago’s Chinatown, I’m considering the possibility of assembling my own… Ready for this? Chi(na)Town Special! Ha – the ChiTown Special. I like it. Let me know how it works out for you if you make this design. 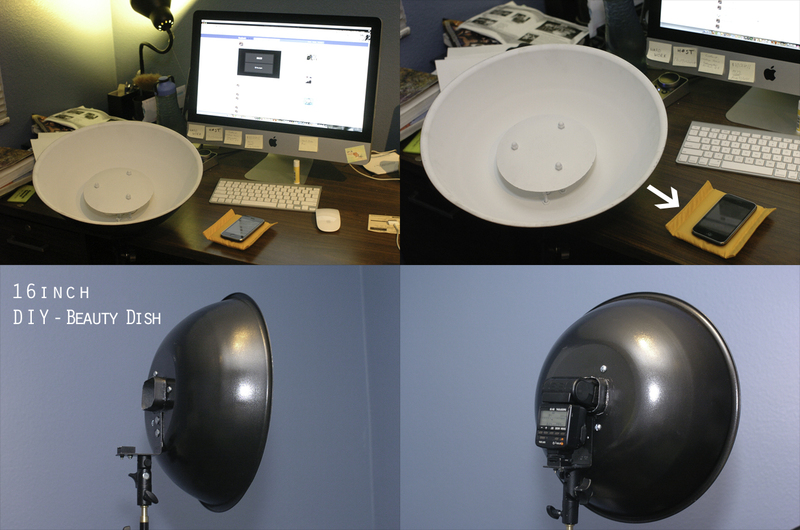 Overall, the 18″ dish is pretty portable, though I’m not sure how much portable it is compared to the 22″ AB beauty dish. You’re welcome, thank you for the kind words. Ha! My discovery this weekend was you cannot just walk into Wal-Mart or Bed, Bath and Beyond and pick up a 16 qt. mixing bowl. Guess my wife the cook coulda told me that. Anyway, I’ll be looking up local restaurant supply shops this week to get the supplies together and get to work. Yeah, I think that 16-quart falls into the more restaurant-scale sort of kitchen duty, just out of range of what most kitchen stores carry. Let me know how this DIY design works out for you. I’m just about to start the early stages of your most recent DIY Beauty Dish as I was highly impressed with your results. I do have one question though, you describe the bowl as 16 Quart. Here in England, we don’t use Quarts as a description when selling items such as bowls and tend to go by the Diameter of the bowl itself. What is the diameter of the bowl you used? The largest I can seem to find is 16″, any larger than that and they become rather deep and wouldn’t be suitable. Thanks for the question. The diameter of the bowl is about 45.75cm – I’m going to amend the parts list to reflect this, as I’ve been getting a few questions about this. Really, any bowl about this size should work, though it generally seems as though larger bowls are much more expensive for a marginal increase in diameter. Definitely will have to see what I can find as a bracket. That’s probably the key thing of this design, and I don’t feel I could make a good L bracket, heh. A Dremel really comes in handy for this project – cutting the stainless steel bowl or drilling out the shape would have been really trying. Where are you located? Prices for the mixing bowl should be about $10 or less. If it can’t be found locally, prices for shipping are going to make doing this DIY project on the cheap hard. I’d check kitchen/restaurant supply stores in your area. It’s possible someone might be able to order it if they don’t carry it. There was one small shop – basically just a consumer kitchenwares shop – that offered to order it for me, even though they only stocked smaller mixing bowls in the store. I’m in Maryland. The asian stores around here I have not checked yet, but hopefully I’ll find something there. I know I’ll probably find a plastic bowl. Thanks for the ebay tip on L brackets, hope they aren’t complete crap for this, heh. Any restaurant supply store should be able to help you out – Asian or not – as long as they are open to the public (many are not). I am tempted to order one of those eBay brackets myself – I’d love to have a reliable source I could point people towards who want to make this design. todd – awesome awesome post.. Thanks for the comment – glad to hear you like this design enough to build it! Are you using an L-bracket? I think that should work well and be plenty sturdy – when in doubt, there’s always epoxy. The polycrylic was recommended to me by someone at Home Depot. I was inquiring about a clear coat and one of the employees said that polycrylic was really want I wanted. The stuff isn’t cheap, but it does seem to work quite well. I’ve got everything for this project except for the EZBox bracket. I was thinking the same thing that you were regarding the adjustment aspect, so I looked around for the bracket. Here’s the hitch, the only brackets I’m finding don’t have the pre-drilled holes in them. This leaves me with the decision to drill the holes in the brackets, or find someplace that has possibly the older design for the bracket that does have the holes… Any thoughts on drilling the holes rendering the bracket useless for future usage? Have you checked out the iShoot eBay speedring/bracket? It looks like it already has predrilled holes, just like the original EZYBox bracket. If you do end up using a bracket that doesn’t have holes, I don’t think you’re really going to hurt anything except for the prettiness of the equipment – you should still be able to use it just fine for other applications in the future. I can switch between the Chinatown Special and the Lastolite softbox in under a minute, so you still have all the flexibility. Thanks so much for posting a link here – your dish looks great. The L-bracket you used looks perfect – low-profile and sturdy. I like the clean look of back of the dish, too. Do you have any photos of the front of the dish? You’re the first person to post their results using this design – I’ll add a link to your dish in the main post. Awesome results, thanks again. Thanks for the link, looks like a nice knock-off bracket that would work great for this design. Just finished one using yours as a template, works a treat! It’s a bit more expensive here in the UK, but well worth the outlay. Thanks for posting these, would love to see some samples once you get a chance to use it. Looks good! Great looking project Todd, thanks for posting such detailed instructions. Your beauty dish looks really good. 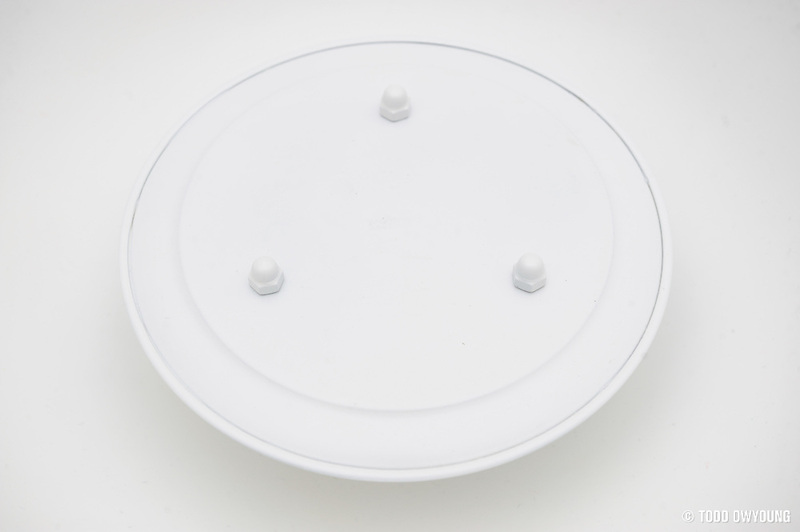 I’m living in the UK too and tried to source the parts without much luck (maybe I’m being too pedantic) – would you mind letting me know where you purchased the bowl and pizza dish? Thanks for the comment – good luck with the project, hope you can source the parts! Finished one last night! Looked all over for DIY dishes and I’m glad I chose your design! My good wife let me use our bowl we have had since we got married… She will be getting a different bowl. She actually did not like this one for her cooking needs. I thought it worked great! But what do I know! I’ll post images later. Looking forward to using this one. But work will get in the way in the next week or so… :( The sweet spot looks to around 2 inches on this bowl. Looks great! Thanks for the credit and linking to my site. You got it, Isaac. Thanks. Hey Chuck, thanks for posting these. That homemade stand is something else. Great post. Plus great excuse to buy a Dremel! I was in Home Depot today picking up all the parts for this and had trouble finding the Polycrylic? The guys in there had no idea what i was asking for. Is it the brand name? The nearest thing they had said it was only for wood. Can’t wait to start assembling it on the weekend! What did you use for an L-bracket? I could not find anything at home depot that was suitable. Thanks for the replies they were really helpful for my return trip to Home Depot today. I ended up having to go for the Behr equivalent as they didn’t have the polycrylic in stock in North Bergen but I think it will be fine. I actually already own a couple of the $30 brackets that other people have linked to from ebay. I can confirm that they work with soft boxes and hopefully with this project too. I think its fair to say that they are cheap and you get what you pay for. They won’t last for ever but in single studio setup they will work just great. If you were dismantling and reassembling them every day they would not survive well. I should have this put together by the end of the weekend and will post result. The Minwax Polycryclic I used was near the spraypaint and wood stains in the painting section of the Home Depots I visited, but looks like you got sorted. I just finished my Dish and it is amazing! Total cost was about 26 bucks(I already had the bracket)! One question about the poly coat, did you spray the interior of the dish with it as well? Even if you use the satin won’t that put a gloss finish on and defeat the purpose of the flat white paint? Thanks so much for this post. Hey Jared, I did spray the inside of the dish. It’s not really glossy enough to affect the spread of the light. Hope this helps! im from germany and i cant find such a bowl you had used. i find two bowls for plants in a home departement store. 42cm or 52cm (example: http://cgi.ebay.de/ws/eBayISAPI.dll?ViewItem&item=370337682871). thank you for this great diy-beautydish. I think that either bowl will work – I couldn’t open that link, but the dish I used was ~45cm. If it’s not too heavy, the 52cm should work just fine, otherwise the 42mm is pretty similar to mine and should be more efficient. I think that 23.5cm would be too large for the 42cm bowl, but it might work alright for the 52cm diameter bowl. For the smaller 42cm dish, something closer to 15-20cm would probably work better. The fit and finish of your dish is fantastic. Just one question, is a true parabolic shape not important to a beauty dish and to the internal reflector? The shape of the dish is important to a degree, since the dish shape is going to dictate scattering properties. That said, there is a bit of a range in the shape of “beauty dishes” when it comes to commercial products. Hey Guys! Thanks for the design! I made one and it works beautifully! 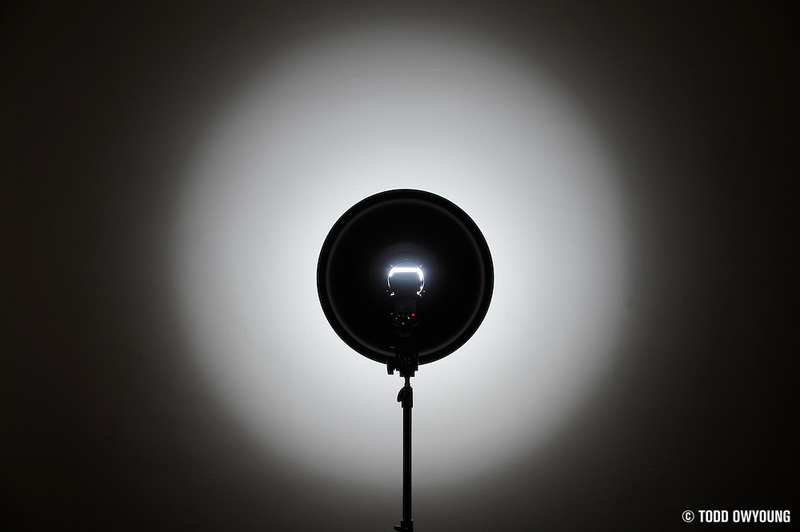 Glad to hear this designed worked out for you – Any photos of/with the DIY beauty dish? Great design! I built one and cut the hole in back large enough to put two flashes through. I would also suggest using carriage bolts on the viewable side of the reflector (they are a bit less noticeable when painted white) and locking nylon nuts. You could probably retrofit one for less than $1. No idea how to “use” it, but it was fun to build. Here’s a picture with carriage bolts. and I bent a piece of metal to hold the two flashes. Thanks for linking to your images of the finished dish – looks good. With a two-flash design, you should be getting a nice amount of power. For a static dish, I think carriage bolts sound like a good option, thanks for the suggestion. i was about to buy a 16qt bowl and a 8in pizza pan as you suggested in your tutorial, but when i went shopping today for the materials i saw that the 20qt bowl was only a couple dollars more,and they also had 10in pizza pans too that i could use. If the 20qt bowl isn’t too much more expensive (locally for me, they were almost twice as much), then go for it. However, you might not necessarily need a larger internal reflector. Since the pizza plates should be relatively cheap, you might want to get both the 8″ and 10″ versions, along with different length machine screws, to see what works best. As for whether the bowl would be too big, it depends on the use. You’re going to lose efficiency with a bigger bowl on the one hand, but you’re gaining a larger effective light source. 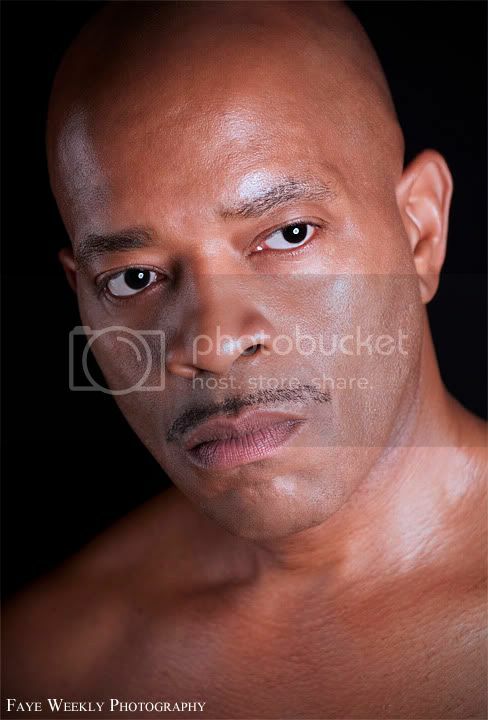 Need to test more on the reflector positioning, and of course, my lighting skills. Could you perhaps link me or send me the right way as to what other kind of L bracket I could use ? I found one on Adorama, but it seems to be a newer version. Thanks. Forget it, I found one. That bracket should work just fine. Good luck. I’ve been following you’re blog for a few months now and love your stuff. The fact that you’re a Nikon shooter makes it even better! I just wanted to say that I actually work in the internet department at Mission Restaurant Supply and just wanted to say thanks for linking up the Browne-Halco Bowl to your website. If you actually do get enough requests for you to build some more of these, shoot me a line back and I’ll see if we can help you out with the supplies you need. This comment is amazing. Just the other day, I was looking at my outbound traffic stats and wondering what you guys thought of the random spike in traffic to that mixing bowl – it’s been the most-clicked outbound link since that tutorial went up! If I do end up making a big batch of these DIY beauty dishes, I will definitely get in touch with you. I appreciate the gesture. The Chinatown Special makes me look like a better photographer than I am. Awesome job! I have only had it for 5 days, and am loving learning how to use it. Bravo, Todd! Exceptionally well-conceived and executed. 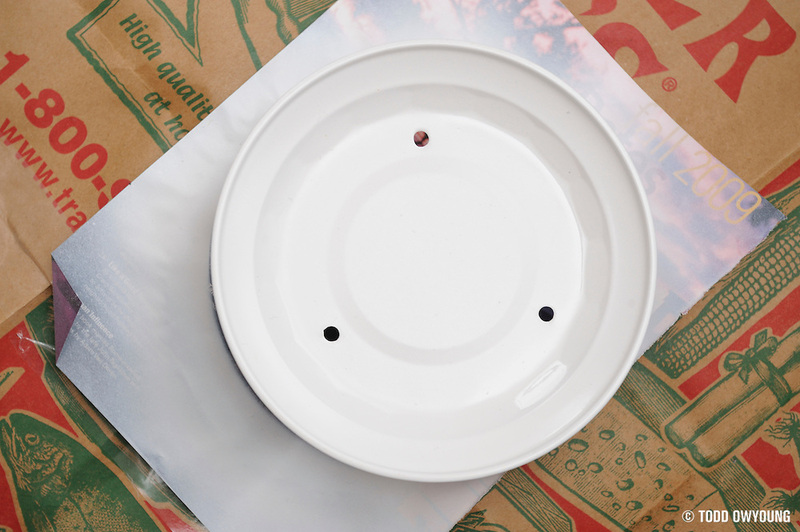 Finally, a DIY beauty dish that not only works but that doesn’t look like a painted flower pot. I’m in the process of completing a variant based on your design (mine has a Bowens mount bolted on the back). One question, though: Did you experiment with different sizes of internal deflector disk? I’ve always thought the 8″ deflector in my 22″ Speedotron dish was too large. FWIW, my unpainted (i.e. still polished steel) dish with a Sunpak 120J as the light source gives a reading of f/45.5 at 3 feet using a 6″ deflector and f/32.2 with the 8″ deflector at the same distance. Last comment: God bless whomever it was that invented the Dremel. RE: Step 4. After doing a bit of reading I came across epoxy primers, it is a little on the expensive side, but I think its the best way to go. Product info: http://cld.ly/eb1urz — I believe that you might also be able to find this at local (i.e. Napa) auto stores. Sorry Todd, now that I used the RTFM (read the manual) philosophy, the question is redundant! Ignore my last post. Anyway, I am blown away by the quality of your photography and your generous donation of time. Have just sourced an 18″ bowl and am about to hack away at it. No worries, good luck with your DIY beauty dish. As always, I’d really love to hear how it turned out and see some photos of the project when you’re finished. Good luck. Amazing tutorial. I like how you guys go out and make the things you need. Bravo! Have you guys ever thought about selling these things? I would totally buy one for my Canon 580EX II! I’d love to make this at home but I don’t have half the tools involved. I haven’t seriously considered selling these dishes – but what might work out is drilling and cutting the bowls, and then selling those unpainted/unfinished pieces. I think the whole thing with powertools is what is a barrier to entry for most folks. Would something like this appeal to you? I would say yes for most part, even myself, with the tools available, I still rather figure out an easier way. ;) nothing like click “buy” on the internet and wait for the unwrap. +1 to seratonin rush! Has anyone tried fitting a grid into one of these DIY beauty dishes? I’m wondering if it will fit snugly and stay in place. I’m having a hard time coming up with a 16 qt. stainless steel mixing bowl. I did find a 13 qt. Do you think that this would work? Hi Jesse, I also could only find a 13qt bowl and it seems to work fine. It is about 14″ diameter. I still want to build a larger one but we don’t seem to eat as much Chinese food here as they do in the States, hence the lack of larger size bowls! I think the smaller 14″ diameter bowl should be still nice for individual portraits. Any restaurant store catering more to commercial clients should be able to order a larger bowl – no relation between Chinese food and big bowls. Hi Todd, of course was only kidding about the Chinese food! The 14″ bowl works well, but I have now found a damaged industrial warehouse “hi-bay” sodium vapour shade. It is made of 1mm aluminium and is 22″ diameter. One concern was that it was too deep, like a deep parabolic reflector, but it seems to work well with a studio flash head. It is too unwieldy for a speedlight, but it is a very cheap option for anyone who wants to build a studio model. I could post a few pics if you tell me how. I think a 13-qt. bowl should be fine – you’ll most likely gain some efficiency at the expense of having a smaller (and harsher) light. But if you get the dish closer to the subject, you’ll be able t minimize some of these differences. Started working on my DIY dish last night. Hardest part (I think) took forever cutting open the flash opening. That’s all I had time to get done last night. Tomorrow night I plan on finishing the thing (have a shoot tonight). As previously asked, has anyone had any luck fitting a grid on here? I’d love to be able to focus the lighting closer for certain setups. Let me know how the dish comes together for you. You’re right, just measuring out and cutting the flash opening takes a lot of time up front. A lot of the rest is just waiting for paint to try. Well the dish itself is done – Good News! Happy with the look of it. Bad news is the bracket I was using (part of my 24″ square softbox) does not work properly. My 580exii can’t extend into the bracket and lines up right at the edge so I have a ton of light spill at the back. Have to find a fix for it, and may need a different bracket. Question: what was the depth of the stainless steel mixing bowl you’ve used? If the reflector is more flat though, the inner reflector disc would have to be larger to close off any direct light leak? Thanks for your informative instructions. My Vivitar 283 can’t extend past the bracket and it lines up right at the edge, so there’s a ton of spill light. Does anyone else have this problem and have you found out how to fix it or found a way around it ? Thanks ! maybe try putting the sleeve of a koozie around the head and jammed up against the back of the dish? I love your idea….one question: The new Lastolite Ezybox Hot Shoe Bracket is plastic and no longer has the holes for the screws. Any good ideas on mounting the new bracket to the dish? To use the new bracket, you’ll need to drill holes in it as well. 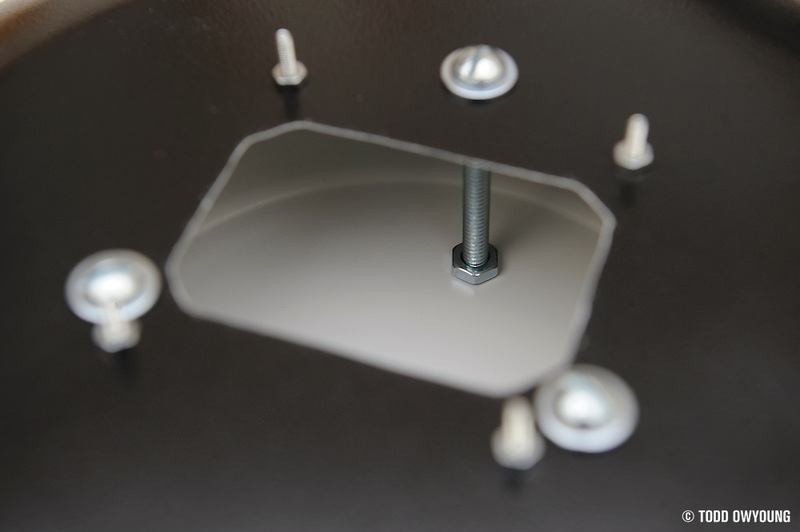 That, or you could position the mounting screws made on the dish in such a way that they retain bracket by tension. As an alternative, the eBay brackets still have the pre-drilled holes. Not sure how the built-in ballhead would hold up, but I haven’t heard of any complaints from people using them. Hi, thanks man for the great tutorial. As a wedding and portrait photographer in Romania (and concert photographer as well) with small strobes, i need a beaty dish and based on your experience i build one. Mine has 40cm diameter, internal disc reflector has 17cm and the bracket was build-up to match the photoflex one for small softboxes. The final work is at my address blog linked at the end. The quality of light is impressive and all of this costs 25$. Link doesn’t show up since it’s a completed auction, but I think I know the one you’re referencing. Let me know how it works out! Well….I finished mine today….I made one addition. I made an adapter ring that is sized to my SB-800. The hole in the actual bowl is large enough for larger flash units. I own a custom framing business and was able to use my computerized mat cutter to cut a circular piece of matboard that goes between the back of the dish and the “lastolite” mount. In the center of the circle is the opening for the SB800. I can make different templates for different flash units. This way the beauty dish is not limited to one size flash. I’ll try to add a few photos soon. I finished my “Chinatown Special” last night. Thanks again Todd for this great idea! Great, thanks for posting up samples! Looking good. since i use SB-28 + RF-602 as my wireless receiver, and I took the hotshoe on the umbrella bracket out, and drill it to hold the flash itself, and the drill the screw for the umbrella bracket to attach to. can you see in there? i have one question tho, the white inside tend to get dirty when grap it the the edge many times, it has like prints haha. is that normal too? or i should just wipe it off with alcohol ? just a thought. .-= Daniel Quoc Nguyen´s last blog ..Nikon D2H on hand review =-. Thanks for posting a photo – looks good. Did you use a down-spout connector on yours? If you used a clear coat on the inside, the edge and inner dish should be pretty easy to wipe off. The coating I used is water-based, but depending on what you used, choose your cleaner appropriately. This is a great resource to me. Finally finished mine using Ebay bracket instead. Great – any photos of the finished dish w/ the bracket? I haven’t actually seen any close up shots of the eBay bracket, so I’m very curious as to how it works with this design. Seems very close to the Lastolite, though. Mine is the eBay bracket….worked very well and all metal except for the knobs. just finished my version of your tutorial-dish! aaaawesome! was my second diy light thingee (first was a ringlight) and it works great. i did it with a plastic planting bowl because i couldn´t get such a big metal one! and i changed the flash shoe thing into a kind of tunnel where the flash is being pushed into! thanks for the fantastic howto! awesome post man. been mulling this over for the past few weeks and i will be seriously considering this for my first major diy project. thanks for the inspiration. That is one gorgeous dish man. I was wondering if you have any experience with the generic bracket similar to yours sold by ishoot. I was curious about the quality. I haven’t personally used the “Ishoot” bracket, but it seems people are satisfied with it for this design. No problems I’ve heard of. Thanks for your tutorial, this is my result. Awesome DIY segment! Very well written instructions and humor to boot. I am inspired to build one over the holiday weekend. 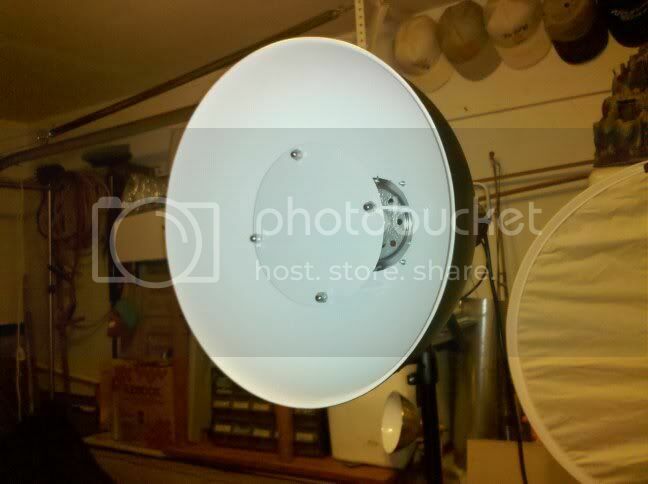 I think I have a 14″ dish laying around somewhere and a mirror for the inner reflector. I will see how the mirror holds up and probably swap out with a white dish as you did. Thanks for the great write up and the images!!! Thanks for making this. I have been meaning to try this for a while and finally started today. The first coat of white paint is drying right now. Thanks for sharing this great tutorial. Any suggestions/idea as to how i can put a grid on this if i were to build one myself? You’re welcome, thanks for the comment & kind words. For a grid for this design, I think the easiest solution would be to get something readymade grid and attach it via velcro to the dish, similarly to how Kacey Enterprises has handled their grid. I ended up using a 24 quart bowl (for use with my studio strobes)… I think it was 24 quarts… anyway, it measured 22″ diameter. Thanks… I have recommended this DIY BD to a lot of people. Glad to hear this design worked well for you – do you have any photos of the 25-quart dish you made, or photos? Would love to see the results. Can’t wait to do a few sample portraits!!! Fantastic build! 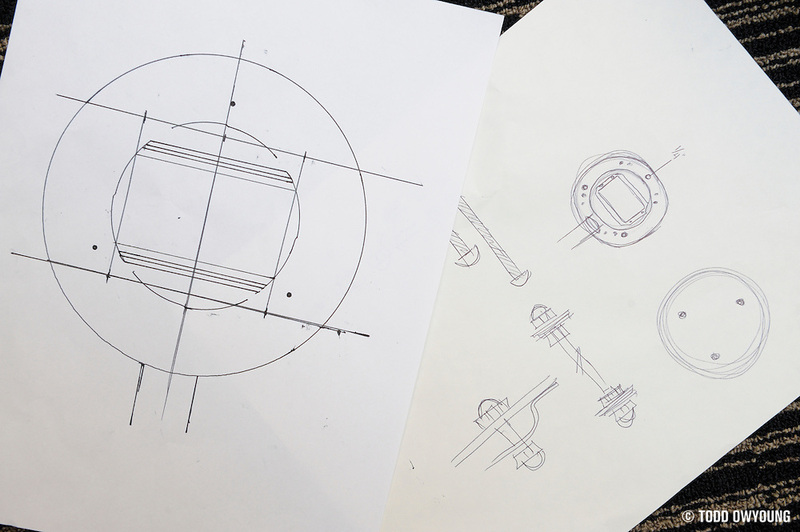 Your dish looks great – I like your tweak of using the retaining bolts as the attachment to the speedring bracket. Nice touch. Looking forward to your work with the dish! Thank you for the inspiration…. we just finished our own 20″ beauty wok!!! how can i make one for my self to accomodate a strobe light? 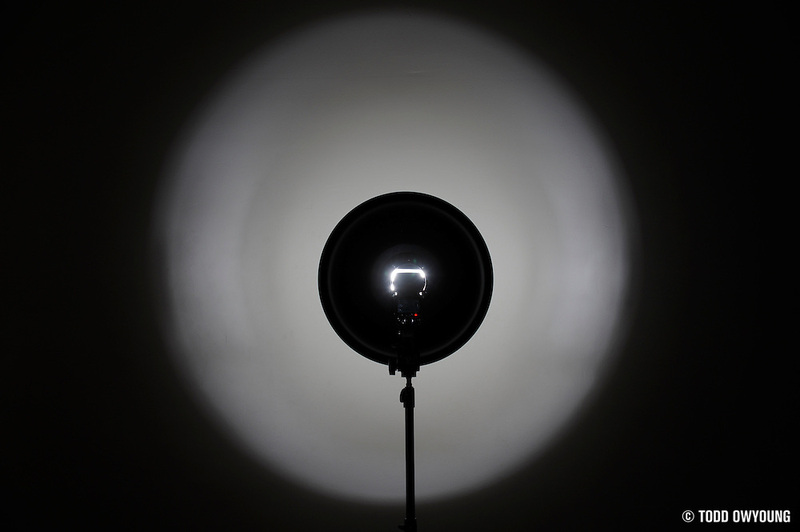 It depends on the mounting system of your strobe – you’ll have to DIY one! Thanks – would love to see how your build turned out – Please post a link to photos if you ever get around to shooting the dish! This beauty dish looks amazing!! This is definitely the most polished, professional looking DIY dish I’ve seen yet. Thanks for the detailed instructions and photos!! I’m going to give this a shot in the next couple weeks. Thanks very much for the comments – when you do make your own dish, please post a link back here so we can see how it turned out. Not sure on quality or anything, but for $60, hard to argue. Wish I had seen this, cause my mount is kinda TOO DIY, heh. I’m building mine primarily for AB800 use though. Sounds good, Jason. Let me know how the design works out for you. I guess with the Alien Bees mount, it should be pretty easy to rig up as long as the hole is cut to size, right? Hey Patrick, looks good, thanks for the link. The poly will scratch if it’s knicked hard enough – but I’ve found that it protects the dish from must use short of having the dish fall on asphalt or something like that. Thanks man… turned out great. Great design, I skipped the mount option and went for the cheaper route. You guys rock!!! That Facebook link didn’t work for me, but glad the design worked out for you. Hey Todd, I just finished up a small dish using your writeup. Outstanding! I completed the entire project, including gathering all my parts, in a single evening. Again bro, excellent writeup and DIY project for those of us who have some spare time and like to do this kind of thing. Props! Hey David, thanks for the link! Sounds like a super fast build, congrats. Glad it worked out for you. I am located in Australia and you may think we are back to front:) But we work in mm and I can not understand you measurements for the connectors. Are these what you call lumber measurement’s, some help would be greatly appreciated? Thanks for your efforts and sharing your passion with the world. The #20 thread count and all of that aren’t critical, as long as all of your connectors have the appropriate matching thread count. You’re good as long as the first three items have the matching thread count and the last two have the same thread count. Hope this helps, and good luck! The website was most helpful, I am now able to work out what I need thanks :) I will let you know how I go and thanks again. Hey Gareth, glad to hear it. Good luck w/ the build! hey tod, finnaly i make mine…. Todd… Thanks for posting this project i just completed mine. It looks SO legit. Hey Scott, you’re welcome, glad it worked out. Hope the dish does the job this weekend! Still using this great dish! Thanks Todd!!! Hey Wes, looks great! Lovely portrait – very nice balance between the ambient and just a little flash. I love that super soft effect. Thanks for the kind words, glad to hear this design worked out for you. Looks like your dish is coming along great – I look forward to seeing the final product. Hey Faye, that dish looks great! The bowl’s sides seem a little steep compared to the bowl I used – will be interested in seeing the output from it. Really nice job finishing it up. Have fun, look forward to seeing the results – thanks for taking the time to post the photos. I have picked up all the bits I need to build my own ChiTown Special and now need to get started. The wholesale place I got the bowl and pizza tray from only had 9″ and 6″ trays so I got one of each while I was there as I wasn’e sure which would be a better compromise. To me the 9″ seems way too big even though it’s only 1″ larger than yours and the 6″ seems more suitable. What do you reckon Todd? my bowl is exactly the same as yours (45cm). I thought maybe if my return is slightly smaller I may need to position it slightly closer than the 3″s you settled on to get a similar result. Oh and I wasn’t 100% sure which way your return was facing judging by the pics, is the lip on the tray curving back in towards the speedlite? Thanks again for a great tutorial and I will post a link to my finished product once complete. Thanks for this detailed tutorial I am making a beauty dish inspired by your design but mine is to fit an Elinchrom Ranger head. I have one question, how did you get the spackled effect on the exterior of the bowl? is that what the minwax finish does or did you use a special black spray paint? Thanks for the comment, hope this tutorial helps. As for the texture, part of that is the MinWax finish and also because of the temperature. It was pretty cold when I was spraying the dishes, so the finish didn’t even out quite as much as it would have if it were warmer. never would have guessed that so, does the white inside of your bowls have the same effect? My local hardware store sells paint that will dry with a similar texture but is quite expensive and would still require some clear coat. I was obviously amused by your paint job it’s very aesthetic and as you stated was by accident? Un-intentional? I will post my own version with examples and will be sure to link back to your tutorial once I complete my project. Todd, This was a genius idea. here is a test shot with my dish. Awesome tutorial! Would you mind sharing the stencil template for the SB-900 as I have one too? Thanks! DUDE!! Awesome Job! That is amazing attention to detail! 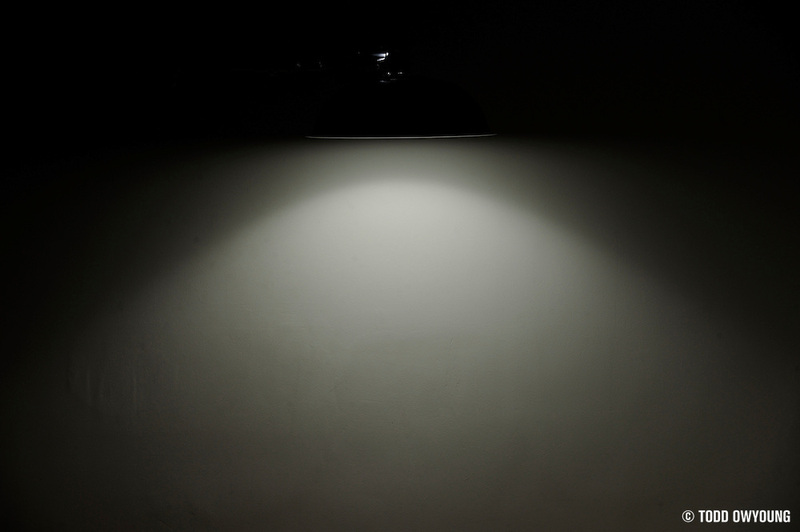 I’ve tried a few DIY lighting devices but I was too embarrassed of them to ever use them with a client. That thing it awesome. I’m gonna pop some ritalin, try to focus and build something close to yours! I’m amazed at the details in your step-by-step instructions to make the Chinatown Special Beauty Dish. I’m pretty handy with tools, especially for a woman ;-) and I really believe I can make this! But I have one question. Does the Dremel EZ406 1 1/2-Inch EZ Lock Rotary Tool Cut-Off Wheel require my having a Dremel 8000-03 Cordless Rotary Tool to hold it, or can it be mounted in a cordless drill / screwdriver such as my Makita 6095D? Obviously I’d like to spend as little as possible to make the dish. Though even if I have to buy the Rotary tool, this project would still be far less expensive than buying a ready made pro dish. @toddowyoung I would love to build it, but need an alternative mount to the lastolite bracket. @jclemonphoto There’s a link in the tutorial to a substitute bracket you can use – available on Amazon or eBay. @toddowyoung I contacted Lastolite and someone was dope enough to send me old-style bracket for free…just the speedring though. RT @toddowyoung: @jclemonphoto There’s a link in the tutorial to a substitute bracket you can use – available on Amazon or eBay. Thanks Todd for the awesome tutorial, I made mine with a 20qt bowl(16qt not sold around my area =( ) the bowl was about 5.5in deep. Using self-cut flat stainless steel plate and i designed a Holder for the bowl too. I am still tuning the best result for the distance reflector. Very cool, thanks very much for posting your results, Ian. I just made one out of a 18″ terra cotta bowl for a SPEEDOTRON 102 head and it came out amazing. Thanks a lot for the easy tutorial. Hey Nick, thanks for the comment. Any photos of how your build turned out? thanks for this diy, great help for those who’s just starting in photography like me. i have a question, i bought a 9″ size pizza tray, will it affect the light output if i use the 9″ rather than the 8″ pizza tray? or what about smaller tray like 7″ or 6″, will it affect the output light? thanks and god bless. 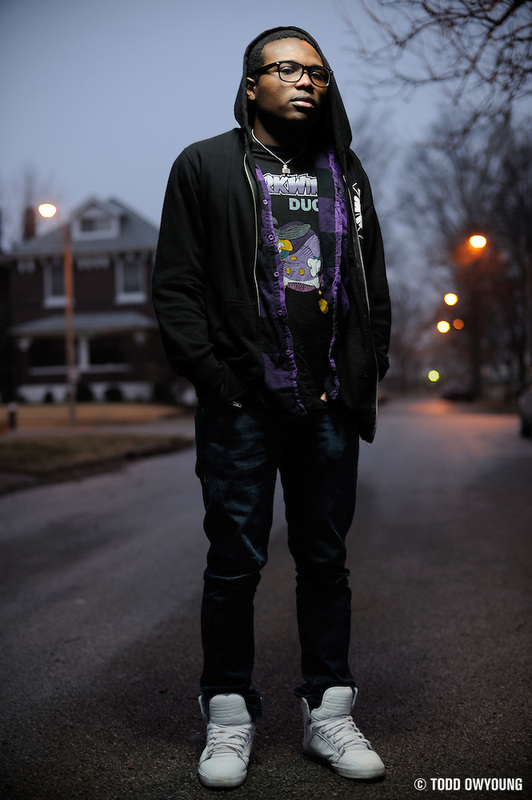 You can use anywhere from a 6-9″ tray, but you’ll have to tweak the position of the reflector in relation to the flash. 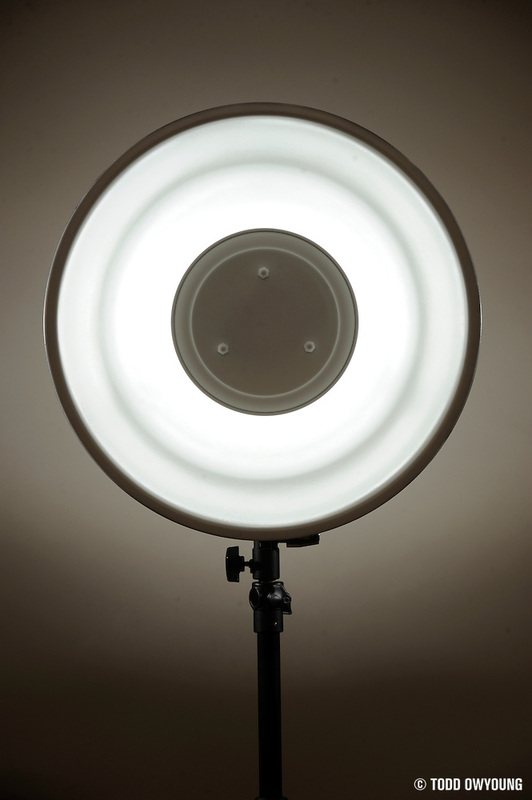 For a smaller reflector, you’ll have to move it closer to the flash – for a larger 9″ tray, you can have it farther away. A larger tray will reflect more light back to the dish, but it’s also going to decrease the surface area of the dish putting out light to the subject. Thanks Todd, I’ll update you once the dish is finished. Awesome tutorial. I just finished mine yesterday and got to snap a test-shot today. The results are really fantastic. Nice shadow fall-off, beautiful catchlights. P.S. I envy your dremel skills. Thanks for the comment, glad to hear the design worked for you. And thanks very much for linking the sample, looks great. you did amazing work ! Just have one more question. How about the connection between the deep of the bowl and the distance between tray and bowl ? How does the light output change ? Do you have any kind of graphic or can you discribe it ? Every bowl and reflector combination will be slightly different, so the “proper” distance will depend on how they fit together. 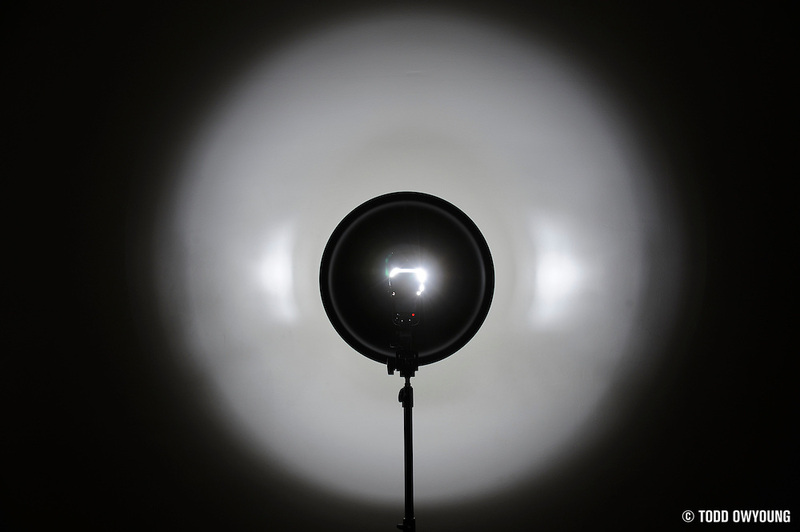 If the reflector is too close to the bowl, the light will be very soft and diffuse, but weak. If you move the reflector farther away, the intensity is likely to increase, but you may have an uneven spread. hi, why are most of the DIY dish use a convex plate or mirror, but the store bought uses a concave inner plate? It all depends on the relation of the materials. I found that a concave relation to the flash head produced the most even light. I did coat the reflector with polycrylic. There’s no affect on the smoothness of the output. No hotspots at all. Glad the design worked for you, please post a link if you end up posting images. Is the final coating a flat, semi-gloss and does it even matter. I have a few friends that work at body shops and can have them pain the pieces for me and wasn’t sure if the gloss would alter the output in an adverse way. Hey Todd – I did it! Finished my DIY Beauty Dish and it came out awesome!!! Your detailed instructions made all the difference and I truly love my dish. Feels so great to accomplish making something so cool & so useful. Here’s a link with photos of the dish itself & first test-shots. Will be doing a full blog article with pics of my my entire construction process, of course crediting your amazing design & how-to’s! Check this link out in the meantime & I’ll post the blog when it’s finished. Thanks so much for following up and posting a link to how the dish turned out. Looks great! Thanks Todd, Got around to processing more of my test shots & the lighting is consistently awesome! These portraits are taken with just the dish & a white Photobasics 40″ reflector for fill light. I haven’t read all of the comments above, but as a slight modification to your design, I added wing nuts to the mount for the bracket for easy removal, as I still wanna be able to switch easily to my mini soft box if I choose. Thanks for your fantastic instructions, you’re a legend. Great blog and post here. Really well done. I just wanted to make a note that Avoid the “similar speedring/bracket” as it is from the Cowboy Studios distributor. I have their hotshoe softbox which is excellent for the price but the hardware is absolute garbage. I have two and both brackets have repeatedly stripped screws rendering the hardware useless. Spend some more bucks and get the Lastolite bracket. Hey Gary, thanks for the kind words, and for the public service announcement. I’m going to have a go at making one of these soon. I’m in the UK so getting the bowl on your link is not ideal. Found one over here thats 40cm diameter x 14cm deep so that should be good enough I think. I’ll be sure to keep you informed once it’s finished. Hey Darrren, I think 40cm should work out just fine for small flash – good luck w/ the build. Hey Todd – Finished my Blog on The Making of My DIY Beauty Dish using your Chinatown Special Design. Thanks for all your information, tips, & support. My new dish is awesome & I have you to thank for that! Janine – As Seen by Janine: Eyes of the World Images. Thanks for posting the link – Excellent tutorial! Love all the photos you shot while you were building it, really well done. Going to post this on Facebook & Twitter. Thanks for the positive feedback on my tutorial Todd & glad you enjoyed the write up. I had a lot of fun with photographing my construction & writing the Blog post. I’m also a special education teacher, aside from being a photographer, so it is in my nature to give very detailed step-by-step instructions. I already did post it to your Facebook page, but did not hit Twitter. Thanks again for sharing your design – I LOVE MY DISH! This looks great, I’m gonna give it a try. Good question. The point here is to have the screws slide into the hole, not thread into it. The other hardware is going to keep the screws in place, so you’ll be fine. Good luck! This is awesome. I’m not handy enough to build my own, so I ordered the Cowboy Studio one you linked to and I can’t wait to try it out. I shoot a Philadelphia roller derby team and I use a lot of techniques I learn about here for team group shots and portraits. Rock bands and derby girls have a lot in common and almost everything you write about applies to them too. Great DIY. So far the best I seen online! ; what polycrylic you used? Matte or Glossy? I am thinking on using clear coat instead of polycrylic, but once again, there are 2 options – matte or glossy. Please let me know which one works better. Hi Arunas, I’d recommend matte or satin for the coat. Good luck. I used Satin finish & I really love the effect. Just enough sheen to make it “look cool” but not enough to cause any glare or hot spots. 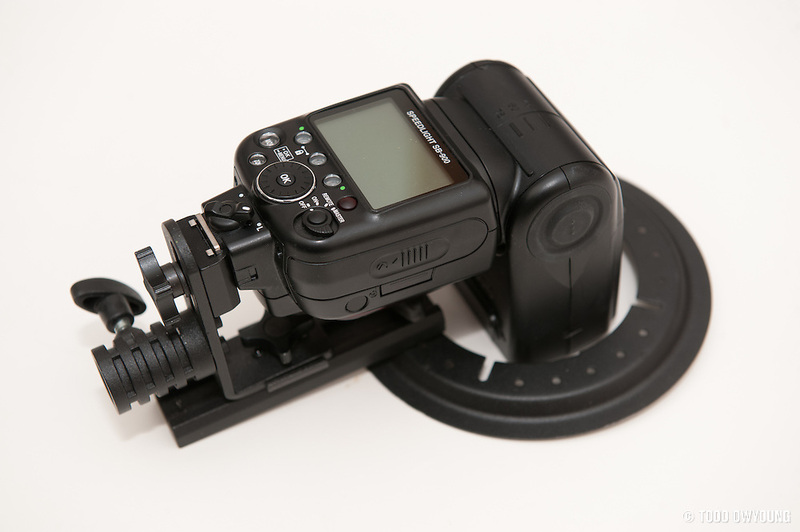 Looks good, Does the bracket move along enough to support a POCKETWIZARD FlexTT5 Transceiver…? I would say no. I tried mounting a Yongnuo RF602 on the bracket with the flash and the receiver hit the vertical adjustment knob not allowing the flash head to reach the opening flushly. I ended up using a cold shoe/miniphone adapter like this one to solve my issue. Great, please post the results once you’re finished, and good luck. I know I am late on the release of this project but thanks man. Honestly, I am so impressed as I read through these comments how you replied to a lot of people. I can’t wait to knock out this project. I’m gonna start with the light grid on first. 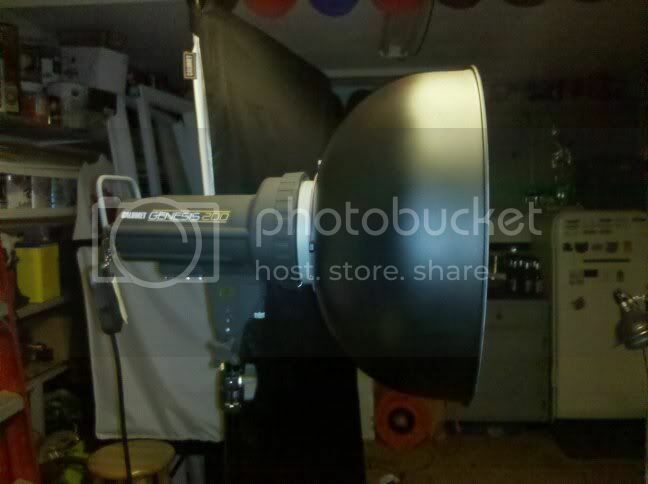 Have fun – and if you do build this beauty dish, please let me know how it goes. I just stumbled across your site/blog. Very nice. And your Beauty Dish is a very nice design. I have a few comments/questions. What I instantly noticed about your set-up, and what made me pay attention, was the fact that the cut-out in the dish is a very tight fit around the Speedlight. That to me suggests that your design is very efficient in that nearly all of the light is going forwards. This contrasts with the off-the-shelf designs where there is a gaping hole around the Speedlight, which seems to me to just waste light as a great deal of the light will hit the central disk and bounce backwards out of the rear of the Beauty Dish. Have you by any chance (or could you, if you haven’t already) done a comparison between the light lost as a result of your design as compared with the off the shelf designs? In fact have you measured the amount of light loss of your Beauty Dish at all? How much do you think the shape (and I guess size) of the Beauty Dish impacts the quality and efficiency of the design? Looking at the deisgn of the commercial product above it seems unusually flat/shallow to me, so I am wondering how much better or different it is going to be as compared to an umbrella? I note that your ChinaTown Special has quite a deep shape. I just had an idea. Perhaps if you make a Mk III of your Beuaty Dish you could make disks with holes of varying size and shape so as to make the Beauty Dish compatible with multiple flash units. Essentially, you would have a large hole in the rear of the Beauty Dish, and this whole would get covered by a plate with a smaller/tighter hole to match the specific model of Speedlight your are using. I just wanted to say thank you first of all for this DIY link! Second of all, you used the 16 qt, any reason why you did not go with the 20qt instead? 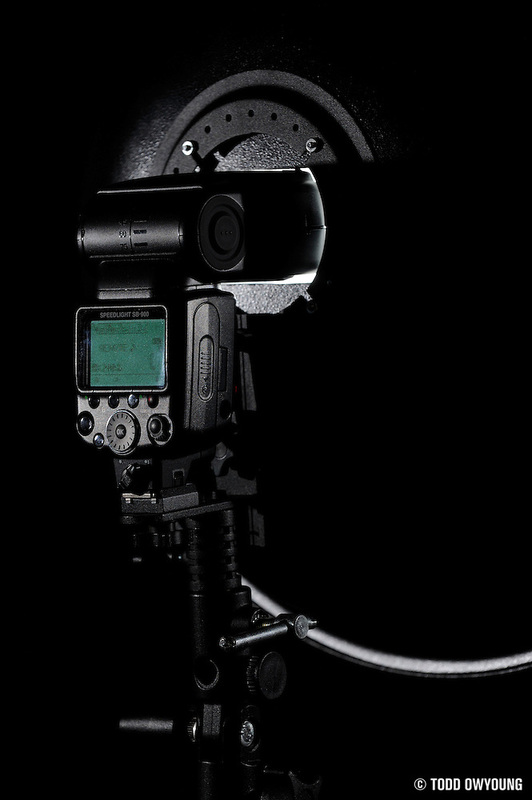 Is the Nikon SB8900 not powerful enough to push the 20qt dish? Have you tried a 20 qt and do you have any pictures to compare the 16 & the 20? So on the return (pizza dish) you painted the outside flat white and left the inside the aluminum?… or did you also paint it white? Both sides of the pizza dish are painted. I built one today but ended up using some aluminium bar stock for the bracket. It works awesome! Thanks again for the tutorial! Oh indeed it’s the best beauty dish ever! I have never seen anything similar. This is really the object that make the photos. I’m so glad I found you on google. Finished my chinatown beauty dish about a week ago, but just tested w/ camera i got back from repairs today. Love it! Just got to learn a bit more on shooting w/ it. I like your pics. I got a church band that I want to do that style. Do you use any additional lighting? Any recommendations on camera and flash settings? I would greatly appreciate it. Not trying to steal your thunder but your photos are inspiring! Finished my Chinatown special about two weeks ago but just tested w/ my camera back from repairs. Luv it. Still practicing. 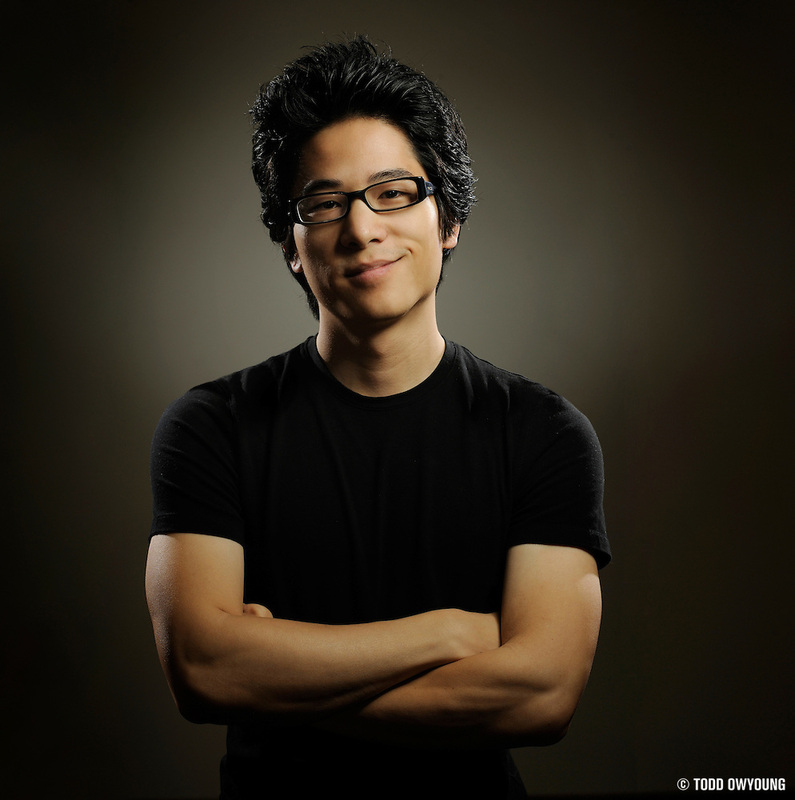 Do you use additional lighting in your pics above or is it solely the beauty dish? If you don’t mind, what settings do you use on camera and flash? I know tings like that vary. I got a church band I want to shoot and would greatly appreciate any pointers. You style is very inspiring!!! 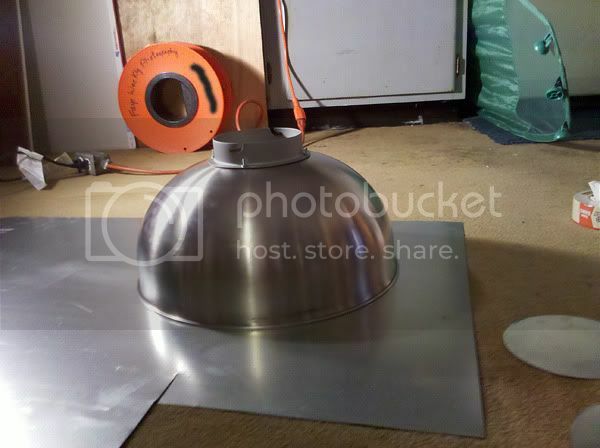 I made my beauty dish from a 16″ metal bowl, but i can’t use radio signal it won’t sincronize anymore. Any sugestions?? What triggers are you using? The metal shouldn’t be an issue with a radio signal if you’re anywhere close to the dish (within several meters). It sounds like you might have a faulty ball head on the dish. To be honest, it is a budget option. It’s not a dish I’ve used, I only recommend it because it’s a relatively cheap alternative if one doesn’t want to make one as a DIY project. Very good post and nice results, but is it really cheaper than buying a complete beauty dish from your dealer? I am going to make two Chinatown beauty dishes for shooting. Really beautiful light congradulations on having the idea and making it happen. Hi Todd! I from Brazil and I love your shots, Im wondering if you had been here to shoot the Rock in Rio Music Festival 2011…By the way, Im considering to buy the stuf to make the Beauty Dish on Amazon, but I have a doubt: You made a 16 inch Beauty dish and used a 8-inch pizza tray as an internal reflector. Im thinking on doing a larger version: a 20 inches one, so, for a better light spreading should I use a 10-inch pizza tray? P.S. I’ll post some pictures of the final product and the sock once it’s all said and done. Thank to you I made two units. – One 34 cm. And the other 45 cm. can You help me with a direct links to both grid that can adjust them + an Idea how to connect them to Beauty Dish?? (I appreciate it very much). Thanks for the comment, but more importantly, thank you for taking the time to “translate” this tutorial for UK residents! Looks like your build and parts list are a great asset for anyone looking to make this in the UK and Europe. Cheers. any Tz’ns to get an answered/links for the grids that I mentioned up here? an Idea how to connect them to Beauty Dish?? I think the easiest way to connect a grid would be with velcro – three attachment points on the grid and the body. what is the Exac 14″ &”18 grids would you buy/Recommends for these DIY Beauty Dishs? if you dont Mind, I have another question! What is the diameter of the pizza plate relative to the size of the diameter of the bowl shood be -and way? My question stems from what I saw that some Beauty Dishs have a very small diameter on the the inside plat (Pizza plate) relative to the size/diameter of the Beauty Dish it self – much mor then what you (Todd) did here. so What ratio should be between them? And what effect we will get if we reduce or increase this ratio? The ratio is 20.35 cm to 45.75cm from the internal reflector (pizza pan) to the bowl, but as I mention in the post, there size of the reflector is going to depend on the shape and size of the bowl. There’s no magic bullet answer – it depends on the way the specific pieces you use fit together. I tried multiple sizes of internal reflectors and I found that the 8″ size worked best for the dish I was using. Hey Chris, thanks for the link. Looks great! I made one for sb600. I haven’t spray painted it. I assemble everything to get a glimpse of the final product and I notice that [b]sb600 head flash[/b] is too short that it cannot reach the hole. Sounds like you need to adjust the flash bracket or possibly create your own. If you want to use the planned setup, just experiment with zooming the SB-600’s flash head to see what produces the best results. I’ve used this design with the SB-600 often, it works just fine. I think I’ll just tape a black paper on the flash head to reach the opening hole. Also, which miniwax type did you use? clear, satin or glossy? I found your post and it made me very excited. I will hack one out these next 2 days, but since I dont live in the US, I’d have to find something locally here, and pizza plates arent common either. Thank you much for your instructions, it helped alot to get things started and get my thoughts together. I run a engineering workshop, so I’ll be cheating and plasma cutting those perforations out instead of dremel. Thx! I should christen my BD The Chinatown Special Beauty Dish – Variant AA. Thank you much for your instructions. Somehow I posted my comments but after submit, the page would not load. Anyways, the post helped me get my thoughts together. Im a hobbyist and rarely get much excited about gear (ever since my guru told me to stay in the photography club and not the camera club… haha). Im using 400D and a kit lense for like 2years now. Invested in some ebay flashes and softboxes instead of lense because I have more fun with them then an L lense. But till I maximise good ol 18-55, then I will shy away from them. Really appreciate the time you took to share with us, albeit this is like 2 years ago, it is still the best DIY dish around. I will hack one out in the next 2 days, with some slight cheats, ie plasma cutting the peforations, since I run an engineering workshop. Please advise if there are any differences between using mate or glossy white paint? Im also into the diy’s and i’m making my dish too. only now i’ve come to the part of assembling the internal reflector. what are the measuremente of the screws in cm? or is there an average size between the bottom of the bowl and the reflector? The screws are 3 inches in length, so that’s 7.62 centimeters. However, performance will depend on what the exact shape of the dish and internal reflector are, so you might need to experiment. I tried various screw lengths before settling on this setup, though this design should work for you as well. Why flat white over gloss? Is it to reduce specularity? Did you test with gloss as well and found flat gives better results? When light hit a reflective surface it reflects back off the surface using the “angle of incidence” idea (Hits at 45°, reflects off in the opposite direction at 45°) As if you were to take a laser pen and shine it in a mirror, it will only illuminate what it directly hits. I just saw this while checking out amazon… It’s hilarious! Thanks for making the video tutorial for this dish. I come across it on youtube while looking for ideas and inspiration to make myself an 18″ beauty dish after my poor attempt at a 12″ beauty dish. Anyway. There’s a link below to the “work in progress” album on my facebook page. 50 Photos, from start to finish. For UK residents wondering where I brought parts, check out the album comments. I’ve listed things there. My 24″ Version of TCS BD. Including a test shot just with the BD, and with a bit of help from ambient daylight. Thanks so much for the idea and instructions on this beauty dish. I managed to make mine for under $40 bc I went with the bracket that included the soft box. I used a 16″ dish but so far things look good. I made some minor tweeks to the parts. I suggest using wing nuts if you want to use the bracket for the softbox at another time. I also neoprene cutout around the hole so the flash fits snug and doesnt scratch the sides of the flash. This also helps with light loss through the back. Again, thanks for sharing! Best of luck to you. Nice, thanks for sharing your modifications on this design, the wing nut idea is great. here is my first test! I’m Starting mine right now, I got the bracket from calumetphoto in store and it was about $40 bucks, tjmax had the bowl but it wasn’t exactly the same just a tad smaller, still big enough I hope… I’ll post some pics of the process and when i’m done! Thanks guys! Here it is ! had to open the back up with a pair of pliers, but was worth it… awesome light! I am wrapping my project up right now. My dish is using a 20qt mixing bowl. I would highly recommend using some primer before the white spray paint; black adhered just fine but nearly all of the white just clumped and fell off. I have used Polycrylic before to seal floors and was really pleased with it there. While building the dish, it yellowed horribly and I had to completely repaint every white surface. I gave the paint over a day to dry before coating so perhaps I just had a bad can. My recommendation is to paint a strip of cardboard or scrap metal and test out how you want to apply the Polycrylic to ensure that you don’t get yellowing. You can also dilute it with water or windex so that it will dry slower with a more smooth finish. Last thought on the this: it would probably be best to coat very small sections at a time if you want the most consistent finish as the poly will run pretty bad if you are doing the whole bowl at once. Due to all the trouble I had with the Polycrylic, I ended up just using some spray on clear coat from the same manufacturer as the paint to finish up. It was much easier, although I don’t know if it will be quite as durable. Thanks for the great tutorial Todd, I’m looking forward to testing mine out later today! Just finished mine after a couple of days of works. Made some errors along the way. I’m not 100 percent happy with it but it’s damn close. Tried myself on a little tutorial during the build but it’s not as good as yours. Great build, thanks for taking such detailed photos during the process of making the dish, Björn. but not shipping to Italy why?!!! you help me please! This is a great idea and I want to make one. Thanks for the step-by-step plans. I was thinking if one could find a mixing bowl made from aluminum or Titanium it would cut down on the weight considerably. I know the cost would go higher but the weight savings would be worth it. However, my searches on the web for a 16-quart Aluminum or titanium bowl have been fruitless. Plus, do you think the opening on the mounting bracket you used would be large enough to place a Elinchrom Quadra adapter and head? I think it would be possible to find an aluminum bowl in this size, though the cost of titanium might make it much harder to find in 18″ diameter bowls. Stainless steel is going to be the most common option. Not 100% sure if the bracket would allow for a Quadra head, but it might be possible to rig something up where you attached directly to the Quadra adapter for using the full-sized Elinchrom accessories. This was a fun project (I went for the larger bowl version), except when a bug landed on my last coat of white paint and I had to sand and paint over bug guts. Oh, and when I left the dish on some newspaper in the yard to dry and my dog took a pee on the paper (resulting in only minor collateral splash clean-up). Looking forward to shooting with my new CTS Beauty Dish! This is awesome! I will be making this very soon. Thank you so much for sharing. I do, however, have one question. What can you use for a grid? I can’t even find replacement grids. By adding this part it keeps the head snug in the hole and eliminates light bleed. I initially had issues making the cut for the hole. I used a Dremel but it’s obvious I lack the skills of a steady hand or whatever. I then used tin snips which I found much easier – so I would suggest to others as an alternative. Overall I’m extremely happy with the result. Thank you for the inspiration and the design. I have used a dessert bowl instead of the pizza plate. Works great. Hi there Tod, finished mine today. And i’ve got great results. I’ve made some changes with the internal reflector, i’ve added aluminium tin foil inside of it, so i have maximazed the output of the B-Dish. I’ve glued it inside. Take a look in these links for the pictures of it. Hey Tod, your recipe for the beauty-dish has arrived in Germany. I’ve just finished mine and it works fine. Thanks a lot for your tutorial. Thanks for the note, very glad the dish works for you. Hope you had some fun making it! Hi Tod – thanks for the great tutorial! I have been using collapsible products that are just not holding up and are really – well – lame. I’m definitely going to take a stab at putting together a Chinatown Special Mark II! (maybe two of them!) We head into China town here in Philly pretty often with our daughter so there are a number of restaurant supply stores! 1) will often use with my sb-800’s, BUT, would like to use with a qflash t5dr as well… suggestions on how to modify to maybe fit both? 2) on that same track… what about a speeding that would take the weight of the dish? basically i was thinking about trying to set it up so that the weight of the assembly is not on the flash head…but rather on the speeding and stand. save the wear and tear on the flash units…? would be grateful for your thoughts!!! Many thanks Todd for spending the time to put this excellent page together for us all to benefit from. It really is a excellent ChinaTown Special, and a worthy name! I just finished mine and it works fantastic, I am going to change the nuts that hold the speedlite ring on, to the butterfly type nuts so i can quickly remove it and still use it on my 24″ softbox, that makes it even better value :). I had some black gloss paint already so I used that instead of matt finish, I also baked it in the oven for a harder finish. That build looks great! Nice looking glossy finish on the back, too. Baking it seems like a good tip as well. Thanks for the kind comment, glad you like the design. Thanks for this post. I’m in the process of making a few camera-related purchases. This will help with the financial burden, and allow me to spend some quality time with pops. The Cancer Bats photo shoot helped me make the decision to go this route. I hopefully will be be taking some band portraits in the very near future. 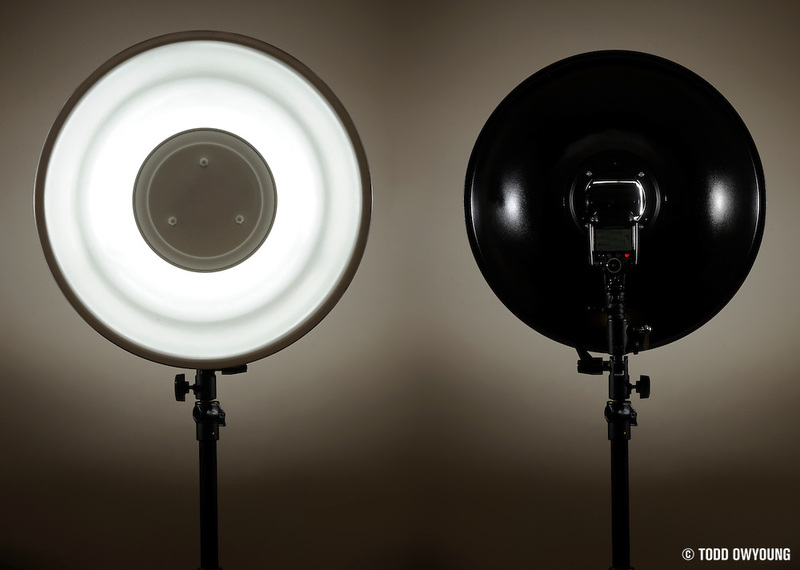 Seeing the quality of light from your DIY beauty dish made it an easy decision. Thanks again. I love how you made this, before seeing your youtube video about the chinatown special, I viewed a few others, that weren’t nearly as easy or nice as yours. I recently bought a new camera, and I’m interested in getting a flash (Nikon), are there any cheap/reasonably cheap that you’d recommend? Great directions! Thanks for the inspiration and sharing! I took your original design and adapted it for a dual-flash setup for two Nikon SB-700s with PocketWizard FlexTT5’s or two Nikon SB-900s/SB-910s. More details can be found here: http://blog.ricmershon.com/?p=3367. More importantly, photos made with my setup can be found here: http://blog.ricmershon.com/?p=3342. I was thrilled, as was the client! Thanks Todd for the inspiration and guidance! Thanks for the comment, very glad to hear that the design worked well for you. Thanks for the links as well, samples look great! Basically all the photos in the Birla series were shot with my Chinatown Special dish. Beautiful work! Did you use a honeycomb grid? Awesome idea, and fantastic results! It’s been next to impossible to find reasonable-priced beauty dishes locally, so this seems like a great DIY project for a rainy day. Have you had any issues with paint-adhesion on the stainless steel? I’d be a little worried about scratching/flaking over time. Thanks for posting this awesome tutorial! Also.. how much would it take to modify this into a studio strobe light beauty dish, where the monolight bulb would be much closer to the secondary..
You know, that’s a good question. Depth probably isn’t a huge concern as long as it’s a “normal-ish” bowl depth. The bowl depth, and as a result how steep or not the sides are, will affect how the light bounces and projects. Every bowl will be a bit different, but I wouldn’t worry about it too much. Thanks Todd.. After sending this in yesterday (please ignore the second post) :-) I decided on a 20qt.. I did find some that “appeared” to be much more shallow (mimicking a store bought beauty dish) but measurement wise, they all seem to be in the 18″ range +/- diameter and about 5″ +/- in depth.. What does seem to be a consideration is the quality of the stainless steel.. Something to note, as there are some really thin cheaper stainless steel bowls which reviews tend to say dent very easily.. Would hate to go through all this and see if ruined by a simple dent! :-) will definitely let you know how it turns out. Again thanks! First.. thanks for such great instructions. Had a quick question on the size (diameter) and depth of the bowl. A lot of the manufacturer based beauty dishes seem very much shallower and have a somewhat curved surface to the reflector. So, is the following true.. A larger, shallower bowl may have a wider area (circle on the wall image), but you would have to be closer to your model vs. a more curved (mixing bowl) shape which might have not as great a spread, but would be more of a “beam” effect? Not 100% where the tradeoff is.. Is the 20qt better in that regard then? Have you tried to curve the reflector? Also, what modifications would have to be made, in your opinion, in using a monolight where the bulb would actually have to protrude past the surface of the bowl? This is on my Top TO-DO List thank you for this awesome tutorial! Amazon here I come! Todd.. Quick question.. I got one of the heavier grade Stainless 20qt, and the sides and top offer very good resistance to denting, twisting, etc. That said, the bottom is thinner than the sides, and I can actually get a little popping flex on the bottom. They say they’re all like that and even the 16 qt ones do it..
First question.. Do you for see it as an issue once all the hardware is mounted, and from your experience, did the bottoms of the one you purchased have any flex in it? I’m hearing elsewhere that the bottoms don’t (in general) have the same thickness as the sides.. don’t know if it is true or not. Thought about reenforcing before adding the speedlight mount. Step 7 (optional): Minwax Polycrylic Protective Finish. 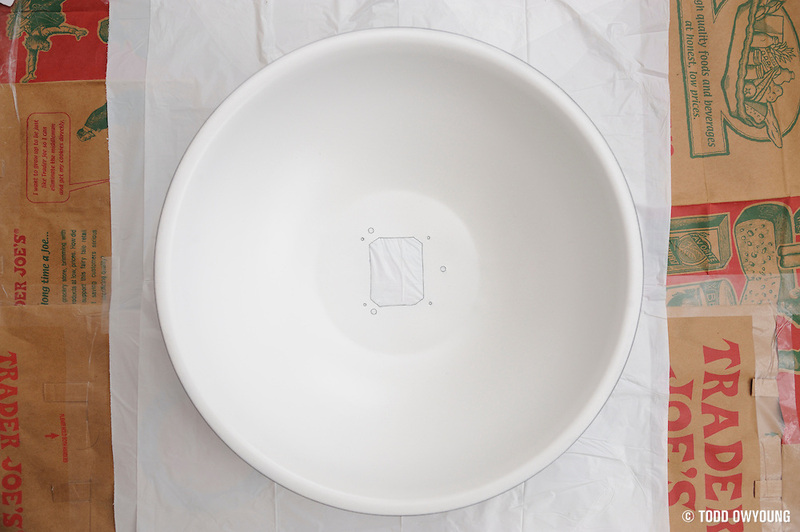 paint the inside of the dish with polycrylic protective film …. it does not create an interior with brightness? a bright interior .. not create reflections? this protective film does not shine? I was able to make this beauty dish and it works great! The only thing I adjusted was the rear cutout (round instead of rectangular) as I wanted the flexibility to use either my Einstein or ETTL flashes. Thank you very much for your great and detailed tutorial! One question I have, for additional light modification, have you been able to find a “sock” to further soften the beauty dish light that fits snug to this particular 16qt bowl size? Really brilliant, just what I was looking for. 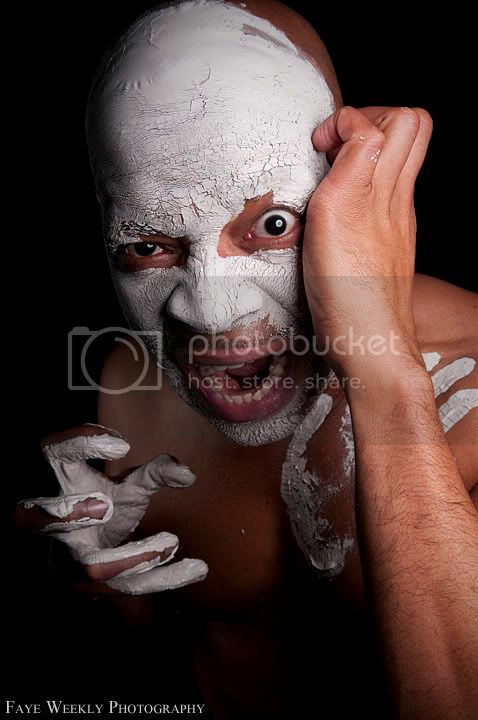 Now, I must say, don’t soften you skin so much. First, I doubt you need it, second it makes you very feminine. Thanks for putting this together, Mindaugas. I found a new garbage disposal sink hole connector in my garage that was left over from the disposal I installed a few years ago and it fit perfectly into the diameter of the flash bracket and the retaining clip and flange looked like it was made for the bracket. Talk about a precision fit it could not have been better! I then attached the disposal flange to the bowl with JB Weld. It turned out great thanks to your detailed instructions, I just hope it does not get smashed when I take it back to Thailand. Thanks for the great tutorial! Just got the parts for my dish, will be starting on it soon. Question: Have you made, or tried a diffuser sock on it? Todd, I was thinking….instead of a large mixing bowl like you used (which is awesome, BTW :) ), what about using the lid from a wok? Of course, an aluminum lid would be ideal, don’t you think? :) Just a thought. Hey Jack, good suggestion. I think it would depend on the curvature of the lid. Just made this amazing thing. Thanks for the writeup. This was pretty painless. Now to test it out. Hey Victor, glad to hear that the build wasn’t too bad for you. The most time-consuming thing is probably just waiting for the paint to dry! Have fun testing it out, I hope it gives you great results! Thanks, Randhir. Let us know how it goes if you ever build this out! Hi Todd. Love the design! Ive been brainstorming on how to make a beauty dish for awhile now, then stumbled upon here and it looks like you did all the work already! Its perfect! I don’t know if you will read this, but figured Id give it a shot in the dark. I have been considering this bracket http://www.amazon.com/ILED-Bracket-Holder-Elinchrom-Speedlight/dp/B00MGLAJ5W/ref=sr_1_7?ie=UTF8&qid=1421614542&sr=8-7&keywords=Neewer%C2%AE+S-Type+Bracket+Holder ….Do you think it would work? I love the design, but worried you wouldn’t be able to aim the dish down, because the dish may not be far forward enough. Also, I would have to drill holes in the bracket, which shouldn’t be a problem, hopefully, haha. Its plastic but supposed to be fairly dense/strong. There is another bracket I could use from amazon that is similar to yours, I am just worried that with an sb-28 the flash will not reach into the dish…Just curious if you have any thoughts on using that particular bracket. You have done this a couple times now it looks like, so if you have any wisdom to share it would be much appreciated! Thanks todd! ps, forgot to mention, id be using the 16qt dish you linked from amazon. Hey Justin, I think that bracket would definitely work — it looks quite sturdy. You’re right, you probably won’t get a ton of downward tilt, but that could always be solved by using a boom arm or something similar to provide additional articulation. Hope this helps, and good luck. Hey Todd, Thanks for getting back. I think I will give it a shot. I just ordered another c-stand, so downward tilt will no longer be an issue. Cant wait to put the dish together/test it out! If you want, I can send you my results. Thanks again for taking the time to get back to me. Much appreciated! ps…love the diy grid spots! This looks great, Jade! Thanks for sharing. Hey guys! Just wanted to thank you for this video. I was able to make one almost just like yours! Glad to hear it. Thanks, Will! Hi! Just seeing this. My husband and I made a beauty dish using a light fixture from Ikea’s As-Is section($5), 2 wire hangers, and a stainless steel mixing bowl. It works on my Dynalite 4040 strobe head, which is what I wanted it for. He put it all together in about an hour or less, and it works great. I am impressed by how good your DIY builds are. Mine never end up looking that good. Your beauty dish, looks just as good as a professional one.